Marvel brings its highly-anticipated Black Panther to theaters this weekend, and while a mid-February release is a bit early for an MCU movie, the hype is just as big as any other Marvel movie, perhaps even bigger. The movie made headlines last week when it scored 100% on Rotten Tomatoes after the first wave of reviews come in, but it has come down to Earth a bit since then, with a 97% (106 Fresh reviews out of 109), and now the big question is can it actually break box office records this month? If it matches our projection of $136.4 million, then, yes, it can. 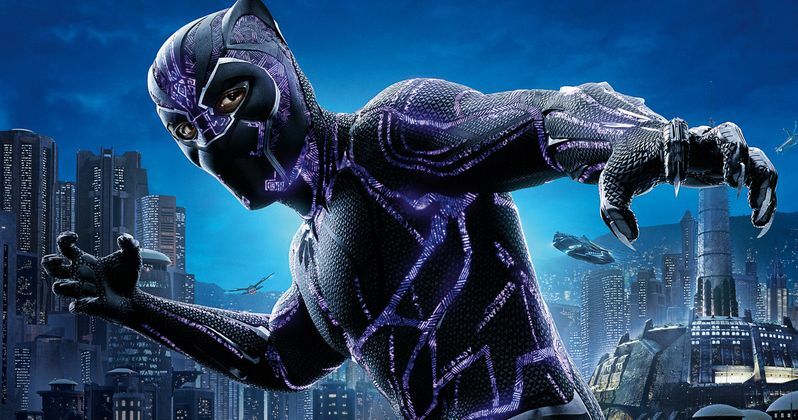 Back in January, box office analysts predicted anywhere between a $100 million and $120 million opening weekend for Black Panther, but that was before the impressive 100% RT score and the extended Super Bowl TV spot was released, which certainly helped add to the growing buzz swirling around the movie. It's not uncommon for any movie of Black Panther's stature to out-gross its box office projections, and if it does hit or exceed $136.4 million, it will break the all-time February opening weekend mark of $132.4 million set just two years ago by the R-rated Deadpool. That movie was projected to open in the $50 million range, so early projections are often not the best barometer. While the critics reviews have been quite amazing thus far, Black Panther has been making headlines for a much different reason as well, with a report from two weeks ago revealing that a group of angry DC fans were planning to sabotage the audience score on Rotten Tomatoes. The Rotten Tomatoes website quickly responded, vowing to shut down this group calling itself "Down with Disney's Treatment of Franchises and its Fanboys," which has more than 3,700 members. As of now, Black Panther has a 94% "want to see" rating from fans, although it will be interesting to see if this group will be able to infiltrate the popular critic aggregator website. Black Panther is expected to debut in roughly 3,800 theaters this weekend, posting a huge advantage over its fellow newcomers, with Aardman's stop-motion caveman movie Early Man expected to arrive in just 2,400 theaters this weekend, while PureFlix's Samson is slated to debut in just 1,200 theaters. We're predicting that the top 5 will be rounded out by last weekend's winner, Fifty Shades Freed, dropping to second place with $14.2 million, with Peter Rabbit nipping close at its heels with $13.9 million in third place, followed by Early Man debuting in fourth place with $8.1 million and The 15:17 to Paris dropping to fifth place with $6.2 million. The top 10 is expected to be rounded out by Jumanji: Welcome to the Jungle ($5.9 million), The Greatest Showman ($4.1 million), The Maze Runner: The Death Cure ($3.3 million), Winchester ($2.3 million) and The Post ($2 million). PureFlix's Samson may have an outisde chance to crack the top 10, but with the movie debuting in 1,200 theaters, it seems unlikely. Also arriving in limited release this weekend is Reliance Entertainment's Aiyaary, FilmRise's The Boy Downstairs, WellGo USA's Detective K: Secret of the Living Dead and The Monkey King 3, Sony Pictures Classics' Loveless, Bleecker Street's Nostalgia, Film Movement's Oh Lucy!, Roadside Attractions' The Party, and Warner Bros.' Detective Chinatown 2, which is expected to open in 100 theaters, although no theater counts were given for the other limited release titles. Looking ahead to next weekend, three more movies hit theaters in wide release, Paramount's Annihilation, Warner Bros.' Game Night and Orion Pictures' Every Day. Also debuting in limited release is Screen Media's Curvature, Hannover House's Death House, Parade Deck Films' Hannah, Epic Pictures' The Lodgers, Oscilloscope Pictures' November, Well Go USA's Operation Red Sea, Gravitas Ventures' Survivors Guide to Prison and The Orchard's The Young Karl Marx. Be sure to check back on Sunday for this weekend's box office estimates, courtesy of Box Office Mojo, but until then, take a look at the projections for the weekend of February 16.